After teaching two writing retreats in Catalonia, I took the train to Madrid. 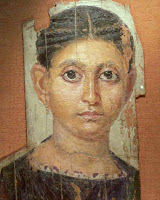 I went for two reasons: to do research for my new novel which is set at the time of the Spanish Civil War and to visit the Archaeological Museum to see the Fayum portraits. I first learned of these extraordinary Egyptian paintings in 1997 when the British Museum had a haunting exhibition featuring them. Made by Greek painters on boards and canvas that covered the faces of the dead, the Fayum mummy portraits were painted on wooden tablets using tempera or pigments mixed with liquid beeswax. 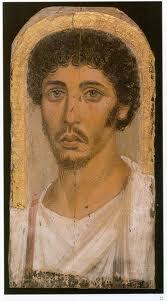 They are the oldest two-dimensional portraits in existence. Created between the 1st and 4th centuries AD, these paintings from El Fayum necropolis were used by the souls of the dead to help them identify their bodies so that they could continue their journey to the afterlife. Sitting on the bench in Madrid seeing all thirteen portraits across the dimly-lit room, not one of them is old, not one of them anywhere near my age. One is a beautiful young woman with large gold earrings that glint in the darkened museum light. She looks like someone I know, but I can’t place her. Through the center of each eye the wood panel has cracked so it looks like she is crying dagger-straight tears. Another is of a young man with a dimpled chin, pillow lips, huge staring blue eyes. He has hair and side burns like the young Tom Jones. Arcing over his head, from one shoulder of his ice-cream white toga to the other, is a delicately carved narrow gilt band. Someone had loved him. The most disturbing portrait is of a young woman with an ugly brown-black stain almost obscuring her right eye as if, in death, someone had blinded her. I sit for at least half an hour, looking into their eyes. Their faces are earnest, naked, alone. I am staring at their painted souls. Each of them looks back at me jealously, wanting to be here, among the living. They are telling me to laugh, to love, to take chances, to make every day—every minute—count because death is very long.